Liberals are the reason Trump is our next president. Some of that was racism and sexism, to be sure, but the biggest reason is arguably that people were tired of the disconnect between what they’re hearing from liberals and what they see in the real world. Liberals create safe spaces on university campuses when they hear things they don’t like. Liberals see Islamic prosecution of gays and women and they say nothing because it’s protected by Islam. Liberals see that Fidel Castro has died and they talk about him like he was Ghandi or Martin Luther King. It’s a disconnect with reality and with their own ideals so severe that when you ask people to accept it they get angry. Quietly angry, mind you, because they don’t want to upset the witch hunters. And then comes along the alt-right, or the neo-nazis, or the white nationalists, or whoever they are. They step up with their websites and their radio stations and their Twitter accounts, and they start spreading their filth. But here’s the problem—mixed in with their filth is a thread of truth about the world. Not truth that justifies their hate, of course, but truth about the problems and injustices that exist that liberals refused to address or even acknowledge. And that’s where the catastrophic strategic error is being made. 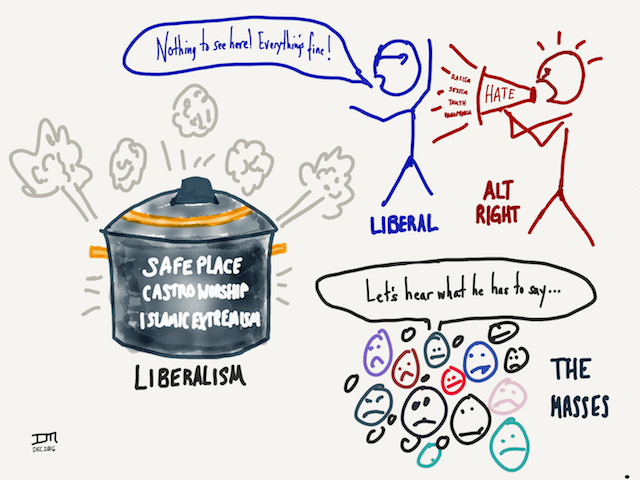 Liberals have made it so that the only people telling the truth about certain issues (the regressive left, islamic extremism, tyrant worship) are people who are also preaching hate. There’s basically nobody in the middle. Nobody is in the middle because if you criticize any of the beliefs of those on the left, you are assumed to be part of the (alt) right, and I’m telling you…it’s a problem. The Democrats are currently trying to do a recount to win back the presidency. But until someone on the left is willing to stand up against the weakness, cowardice, and hypocrisy coming from so-called progressives, we’re going to continue to see the extreme right be listened to. Not just by young, uneducated white people. No. By minorities. By educated people. By people in the midwest. By people in the cities. By LOTS of people. If the only people speaking truth (even mixed among hate and lies) are right-wing extremists, you should expect bad things to happen. Image from…um…me! It’s my first political cartoon. I know the art is horrible, but 1) I don’t know how to draw people, and 2) I made it quickly.